Getting ahead of the competition in the fresh food industry isn’t easy, but Aussie Farmers Direct’s new digitally agile marketing strategy is set to boost customer engagement and retention. As part of its digital transformation strategy, the Australian business last year embarked on building a new responsive digital platform based on the same technology used by Facebook. “This has made our development process incredibly quick, and has also meant we are no longer maintaining six different platforms as we had been previously,” Aussie Farmers Direct’s marketing director, Peter Bakker, told CMO. According to Bakker, one of the features of the platform is the built-in landing pages that adjust messaging on the site based on the ad/article a visitor clicks on. “For example, if you click on an ad that is about fussy eaters, the message and imagery will continue in site,” he explained. “If you saw a message about the dangers of $1 supermarket milk, we will explain where to find more information about that. Creating this continuity in the journey is something that we feel – and the data shows – is incredibly important. We can also use these landing-pages for email, chat and other channels. It’s really powerful. 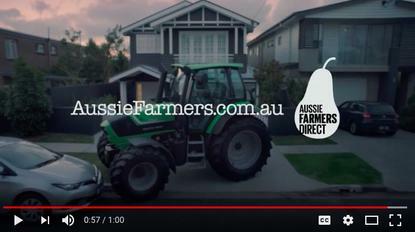 Aussie Farmers Direct recently released a new multi-channel brand campaign demonstrating the simplicity of using digital methods to buy as a customer, against traditional habits. It features a mum and dad’s attempts at being urban farmers, much to the embarrassment of their tech-savvy kids. While the parents struggle to train the family pooch as a sheepdog, take their tractor on the school pick-up run and tend to a forlorn veggie garden, their children are saving the day by ordering farm-fresh meals online from Aussie Farmers Direct using mobile and tablet technology. “We have a great business that is very different from the big supermarkets, but not enough people know about us,” Bakker said. “We needed to create a campaign that highlights our heritage of supporting farmers, the convenience of our offer, and also showcase the exciting new products we’ve recently brought to market. According to Bakker, the campaign also reflected how the Aussie Farmers Direct range has grown to meet customers’ needs, while remaining true to its roots of supporting Aussie farmers. “Instead of taking up farming yourself, the campaign highlights how easy it is to put delicious meals on the table using one of our great value dinner boxes,” Bakker claimed. The campaign also highlights the launch of the company’s new ‘The General Store’, a grocery site that lets customers get their full food and grocery shop and say goodbye to the supermarket in the process. Launched about six months ago in Victoria, the General Store has since been rolled out to NSW and Queensland, with plans to expand to South Australia and Western Australia. “The main reason why we opened The General Store is because our members were asking us to make shopping for dry groceries as convenient and Australian as we did for fresh produce,” Bakker said. “Our customers are loving the fact they can now add their pantry and grocery needs to their Aussie Farmers order, and it all arrives in one convenient delivery. However, not all of these products [sadly] are 100 per cent Australian. True to the company’s mission to support local farmers, Bakker said some categories, in particular tinned fruit and veggies, were felt to be close to its rural heritage. So the company decided not to sell any imported line where there was a local option available. “On top of that, we donate 10 per cent of the profits of The General Store to the Aussie Farmers Foundation so we are sure that even when we sell some international products we are still supporting our Australian farmers,” Bakker added. “And we deliver the goods for The General Store in the same delivery as the Aussie Farmers Direct shop - so super it’s convenient. Despite the leaps and bounds made in digital transformation, Bakker stressed the journey was not without its challenges. Another hurdle was having enough digitally savvy people to make the journey easy and ‘native’.